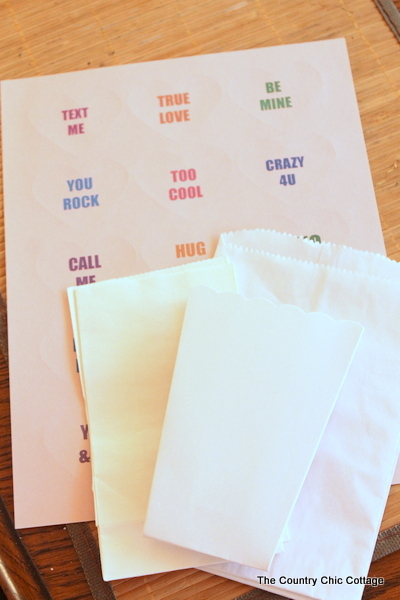 Our last day of Craft Lightning and I am wrapping things up with some fun conversation heart printable treat labels. Grab some heart labels and make your own conversation heart stickers in just a few minutes. You can then use those for treat bags or anything else this Valentine’s Day. 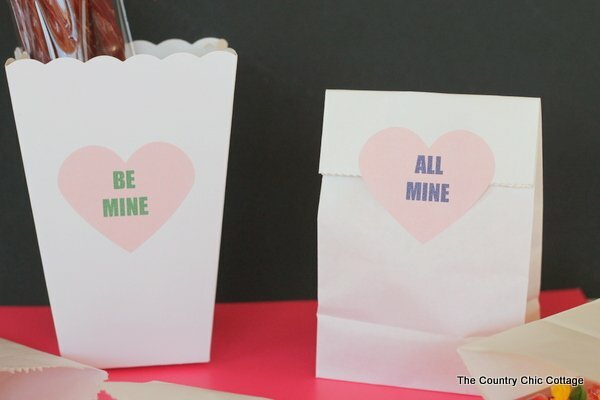 Want more quick and easy Valentine’s Day crafts? Be sure to check out the Craft Lightning round ups from day 1/2, day 3, and day 4. The wonderful people at Online Labels were kind enough to sponsor this post and send me a few sheets of OL196PX which is a pastel pink heart label sheet. I immediately thought of conversation hearts when I saw it. 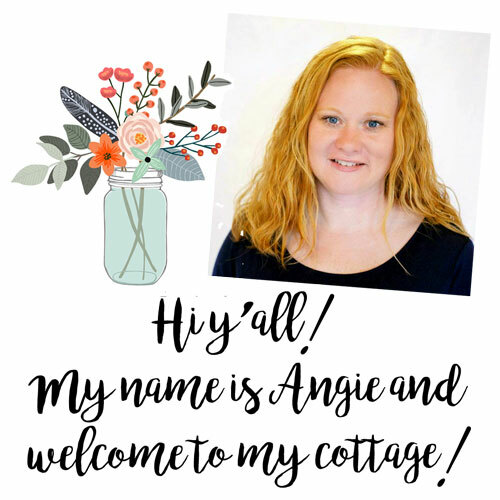 I created my conversation heart printable treat labels. Click here to print your own conversation heart labels. Need to buy the heart labels? Click here to buy the heart shaped labels from Online Labels. Then just add candy to any bag and place a heart label to close. These are so simple and quick but yet they are adorable. I also had some large popcorn boxes at home that were plain white. 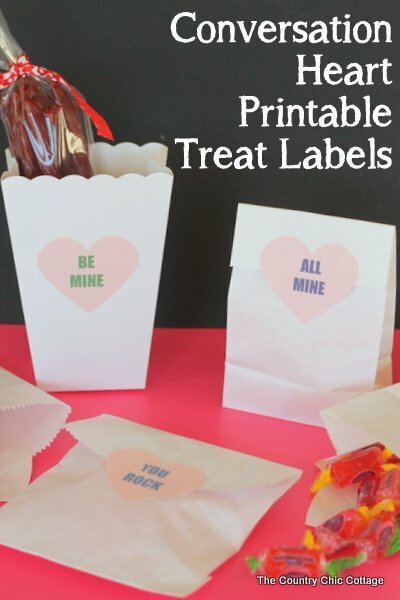 You can add these labels to the front of something similar for a fun treat container. Add in long candy (like licorice) or popcorn and you have a fun treat to give to the class. 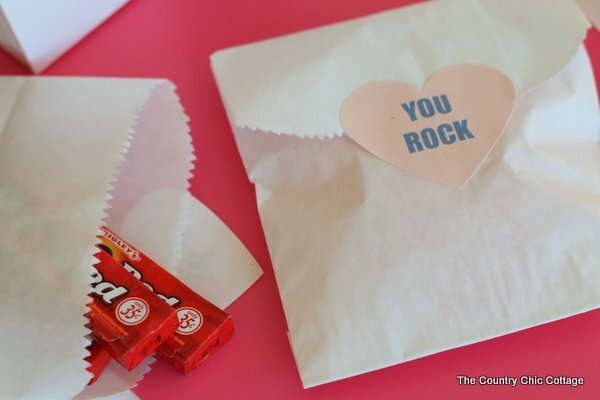 No matter what bag or container you choose, use my conversation heart printable treat labels to close and decorate them. 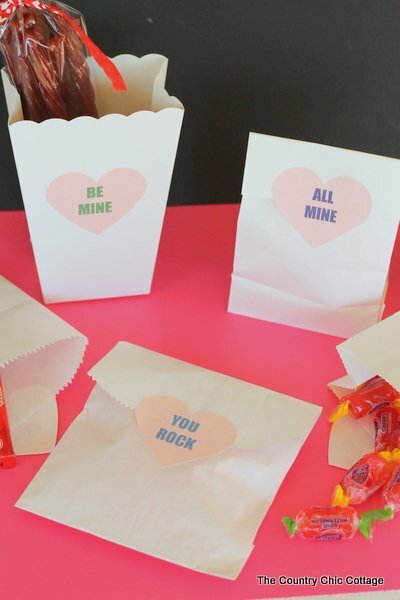 This is a fun and unique way to give candy this Valentine’s Day. Plus it only takes a few minutes to add this handmade touch. With sayings like “text me” and “awe some”, these conversation hearts might just get a few giggles as well. I hope y’all have enjoyed the Valentine’s Day edition of Craft Lightning. I will be back this weekend to round up the entire series for you so stay tuned. Online Labels is the sponsor for this post however all projects and opinions are my own. This is such a cute and easy idea – love it! These are adorable! What a cute way to seal a lunchbag shut! Since these are already pink, I imagine they take very little ink to print… and yet they look so awesome! Love these conversation heart labels! How fun, I had no idea they even sold heart labels.